(LEXINGTON, Ky.) – As Harvey’s winds died down, yet while the waters were still rising, Alltech launched Hope After Harvey to raise support for Texas farmers and ranchers, who lead the U.S. in cattle, cotton, hay, sheep and goat production. Alltech committed to match donations made to its 501(c)(3) nonprofit, the Alltech ACE Foundation. 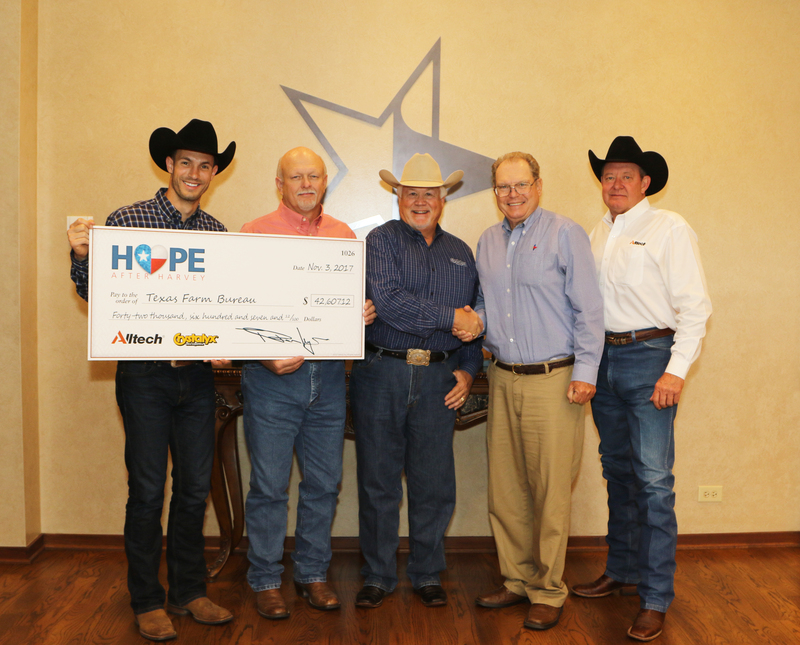 As a result of the Hope After Harvey donation response, Alltech representatives presented Texas Farm Bureau’s (TFB) Agriculture Research and Education Foundation with a $42,607.12 check. The funds will be used to provide support and relief to those in agriculture who were affected by Hurricane Harvey. Additionally, the Alltech family committed to donating $100,000 in value of animal feed and crop products, which have been distributed through dealers and Texas A&M AgriLife Extension Service. An Alltech team from the Buffalo, Texas area also spent six days near Winnie, Texas, gathering cattle in flood waters. Founded in 1980 by Irish entrepreneur and scientist Dr. Pearse Lyons, Alltech discovers and delivers solutions for the sustainable nutrition of plants, animals and people. With more than 100 manufacturing sites globally, Alltech is a leading producer and processor of yeast and organic trace minerals, and our flagship algae production facility in Kentucky is one of only two of its kind in the world. Our guiding ACE principle seeks to develop solutions that are safe for the Animal, Consumer and the Environment. Our more than 5,000 team members worldwide put this purpose to work every day for our customers. Alltech’s Hope After Harvey campaign resulted in a donation of $42,607.12 to Texas Farm Bureau’s Hurricane Harvey Relief Fund. Pictured left to right are Brian Lawless, business development manager, Alltech; Si Cook, Texas Farm Bureau executive director/chief operating officer; Lee Pritchard, account manager for Ridley Block Operations, an Alltech company; Neil Walter, Texas Farm Bureau District 8 state director; and Randy Asher, regional sales manager for Alltech.